I need it really fast and I don't have a lot of money. Oh and I want to be able to control it after your done because I don't want to pay you for your maintenance and community servicing ability. Wait… it needs to be 'social ready,' have blog ability, browser based CMS, and tons of widgets! Oh, oh, oh – it should have a free mobile app where I can post while I'm in the airport! Well of course it should have a built in traffic and metrics – don't be silly. I realize that Blogger, Worpress, Typepad, Virb (which looks cool) and others offer these services, and that all blogging-style content management systems (CMS) have similar qualities. But here's the rub for me, I being of sound design, CSS and HTML mind can, using their WYSIWYG, make a site very quickly. Additionally, I can teach a client how to use it within an hour. From a maintenance standpoint I can help them plug-in widgets, make custom headers and various templates. So you're not cutting off your nose should you want to establish a long-term relationship that can be mutually beneficial. They're slow to adapt to new technologies, ad models etc. BUT WHO CAN BLAME THEM!?! With almost every technology, albeit social or not, being on a planned obsolescence fuse from hell I wouldn't want to commit my developer’s time to it either. I wish they had more base templates to choose from. I'd like the traffic metrics 'listening dashboard' to be more robust, such as adding more social buzz and alerts tools. That being said, I'm going to tell you that I LOVE this service. The customer service is outstanding. It's very all-inclusive solution, being that you host and get the CMS and traffic system under one roof. And if you’re savvy with the code you can make it dance more than the two-step. What most non-enterprise level clients want more than anything nowadays is a product that they feel they can control. Over the nearly two decades I've been building websites, there's little available since blog CMS's that give a user the sense of control that I feel will be a prerequisite for future software applications. This is not to say that it will inherently kill the need for agencies and development shops to maintain the content and guide the campaign directives. But what it does do is give clients the safety net that they have not had. Most often I find, as within most business models, the client [thinks] they want to have it built and then take it over. Suffice it to say what almost invariably happens is this, the client takes it over and they see that "holy crap, this is actually a lot of work that I don't want to deal with," and it comes back to you. Therefore, what's nice about browser based CMS's is that they're (more often than not) easy to train someone to use — people respond well within a basic Microsoft Word-like editor. 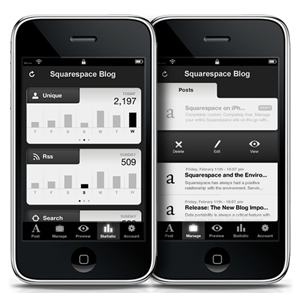 For most SquareSpace is all you're going to need. What CMS are you using for your blog? What do you like or dislike about it? I'd love to hear about new systems too. If there's one you'd like to use and review I'd love to get in the mix! For web designers and web developers, fear not, the application provides a great amount of versatility and range of customization. Additionally, you can build and deploy rapidly giving you the ability to actual make money. Wow, what a concept.